Don’t Skip Out On Me by Willy Vlautin. Patterson talks to Bitter Southerner and it’s beautiful. New tourdates for Patterson’s solo show have been added – including NYC, Washington DC, Richmond, Vancouver, Seattle, Atlanta, and more! Check them out on the Tour page. The Modern School of Film and the Carolina Theatre of Durham in Association with Guitartown Present Film: Acoustic with Patterson Hood of Drive-By Truckers. Patterson will be screening Network at the Carolina Theatre on Monday, April 13th at 7 pm. Tickets go on sale March 12 at 10 am. More details, including ticket info here. 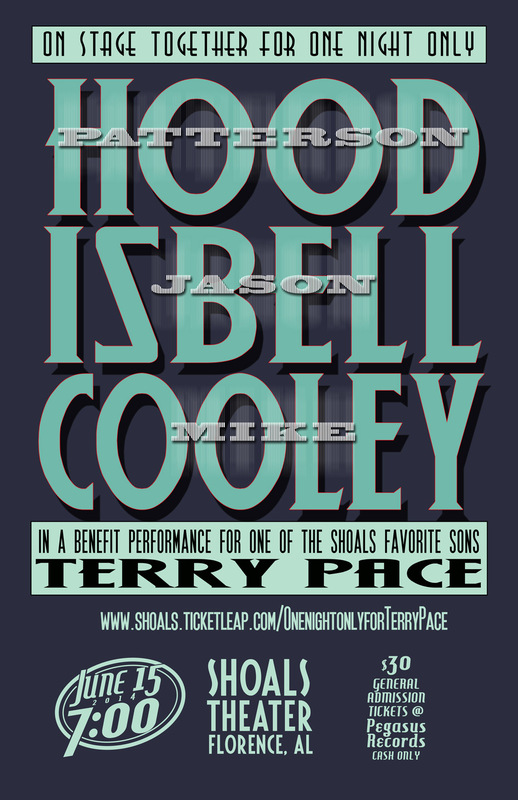 FLORENCE – Shoals natives and critically-acclaimed songwriters/performers Jason Isbell, Patterson Hood and Mike Cooley are pooling their exceptional talents for a one-night-only concert to benefit their lifelong friend Terry Pace. 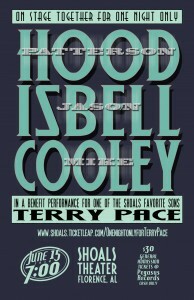 The trio will headline a fundraiser on Sunday, June 15, at 7 p.m. at the Shoals Theatre. This will be the first time they have played on stage together in several years. Pace suffered two debilitating strokes in March which required several weeks of hospitalization in Birmingham. He was recently released from the hospital and is recovering at his home in Sheffield. Rehabilitation will be a long, expensive process and the medical costs continue to mount. Prior to his illness, Pace was the director of UNA’s Office of Communications and Marketing. For the past eight years, he taught freshman composition and sophomore literature in the UNA Department of English. He also led classes on film appreciation and the history of Muscle Shoals music. For the past 30 years Pace has been a central figure in local music and theatrical circles. He is an actor, director, producer, lecturer and music historian who has been active in supporting and writing about the Muscle Shoals music scene.